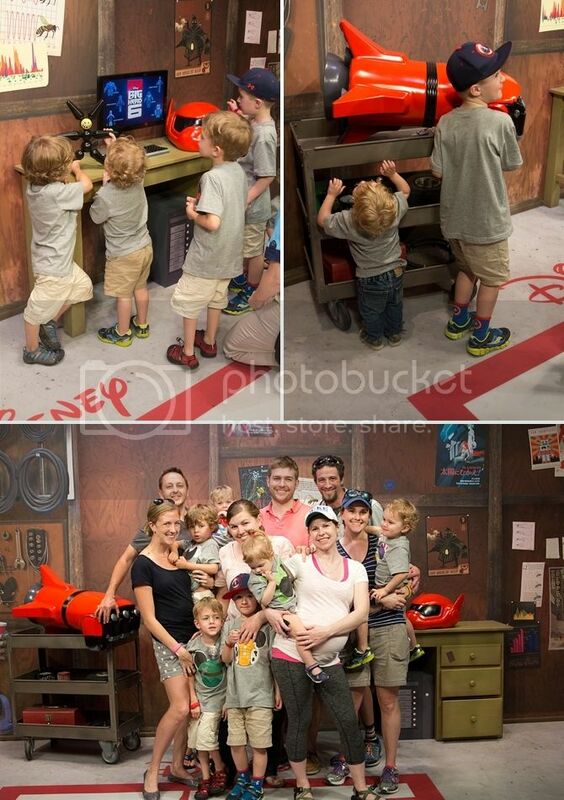 Hollywood Studios is such a fun one for kids and grown-ups! After doing a few rides, we headed over to Hollywood and Vine for lunch. I tried to schedule a few character meals while we were there--it's fun for the kids and relaxing for the parents... even if it is a little pricier. You can only eat park burgers so many times before you begin to die inside. 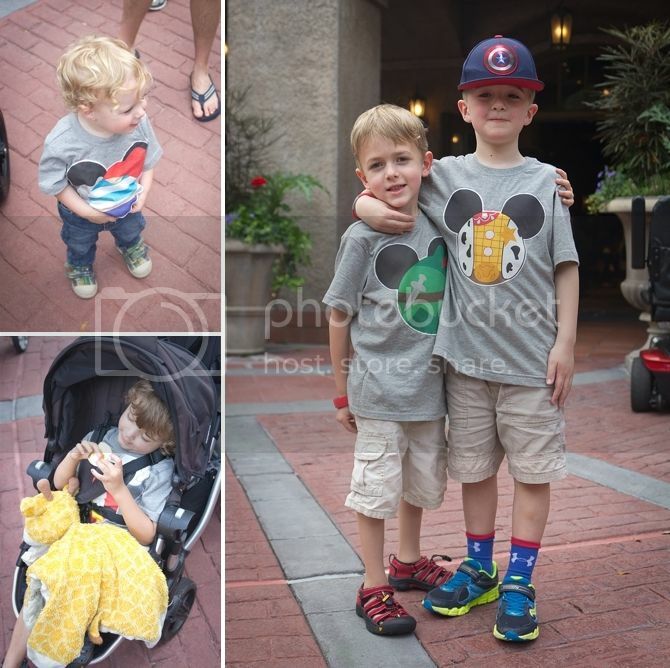 Today's shirts were Mickey characters. The Woods boys were Buzz and Woody and my boys and Piper were Peter Pan characters. I'm getting to be a pro at making these shirts... but I don't want to make any more. I retire. 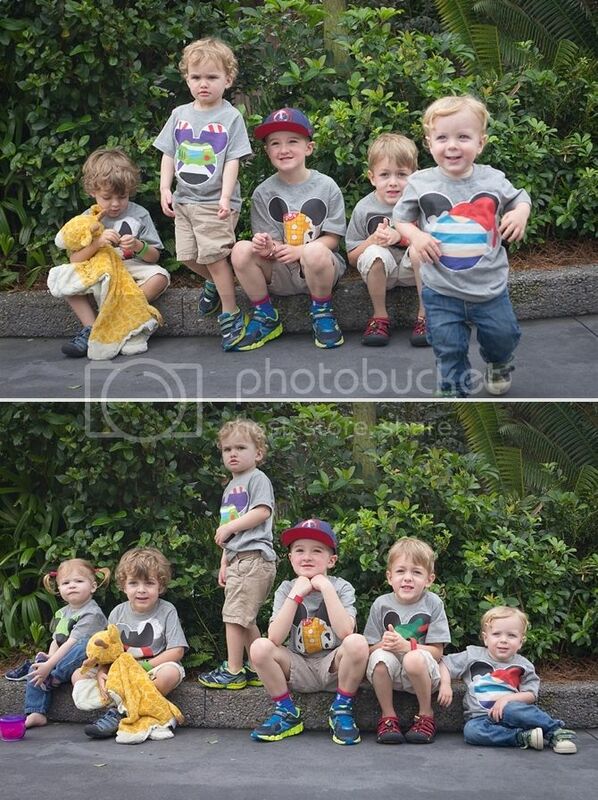 As you might expect, getting a picture of all 6 kids went poorly. That second one is about as good as it gets! Finley was so delighted to have Edmund there with him--even if Edmund was bigger (but younger!) and could do all the roller coasters. Next time pal! Maybe. Want to hear a Disney secret? A few times a day, there's an unpublicized character meet and greet through some gates behind the Tower of Terror--called Characterpalooza. We got there about 10 minutes early and waited to see which characters would be there and met Princess Tiana and Aladdin and the Genie! Sometimes awesome characters like Mary Poppins and Bert will be there--or Robin Hood, a favorite around our house. 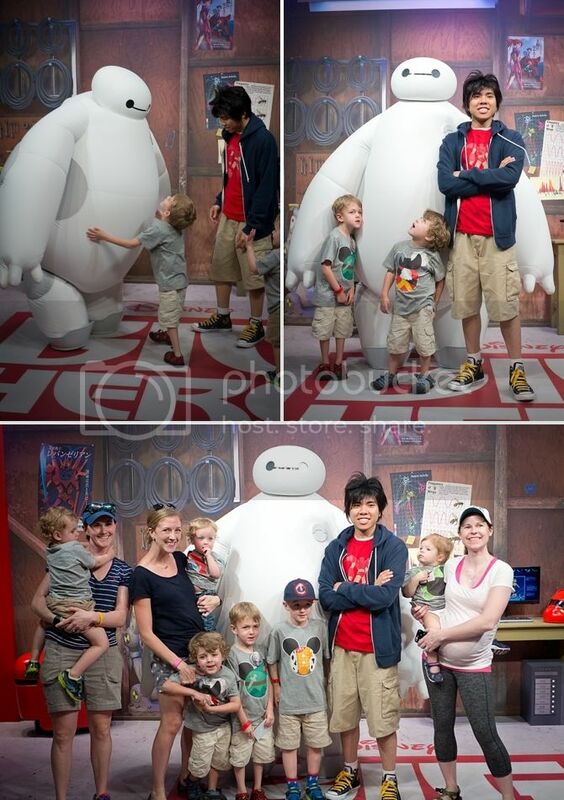 All the boys were most excited to see Hiro and Baymax. We're pretty obsessed with Big Hero 6 these days. We waited in a LONG LONG line and right as we got to the front--Baymax had to go "recharge". The sweet cast member let the boys run all over Hiro's lab and talked to them about everything--it was sweet and much needed after the super long wait. We squeezed in a group picture with everyone looking before Hiro and Baymax came back out. Baymax was pretty impressive. 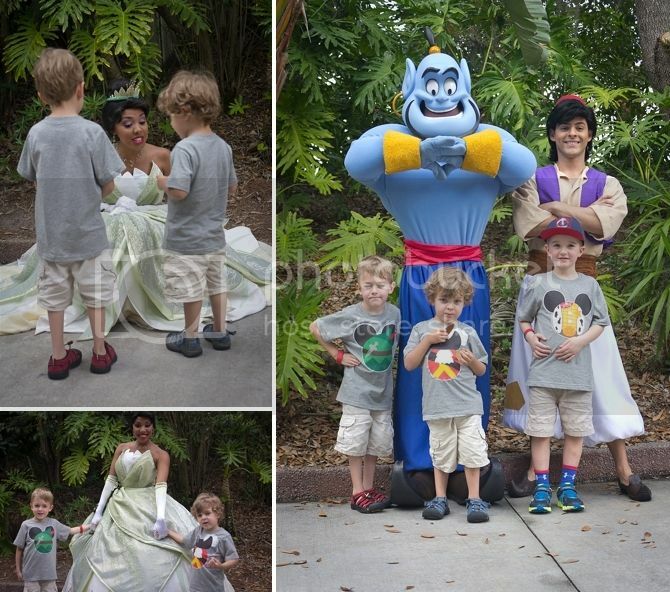 The boys really liked seeing both of them! 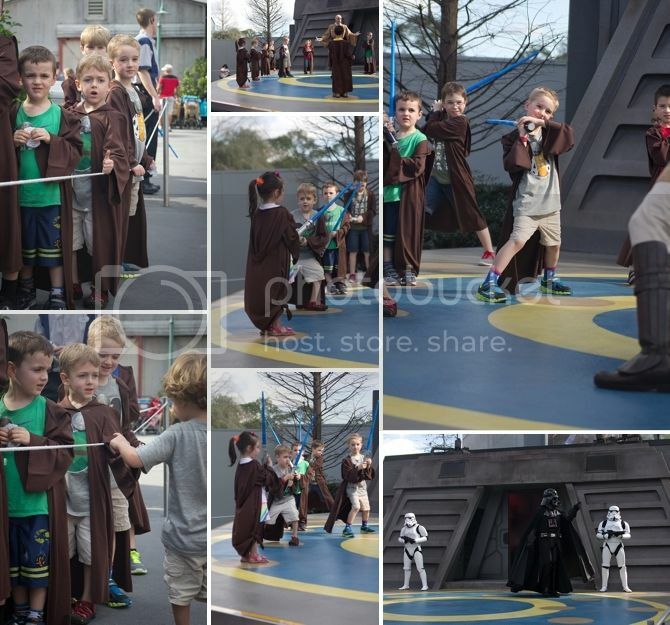 We dod the Jedi Training Academy on our last visit--but it was too rainy for the little Jedis to actually fight Darth. This time... they got to fight him! Edmund and Finley were adorable and were quite terrifying with their light sabers. 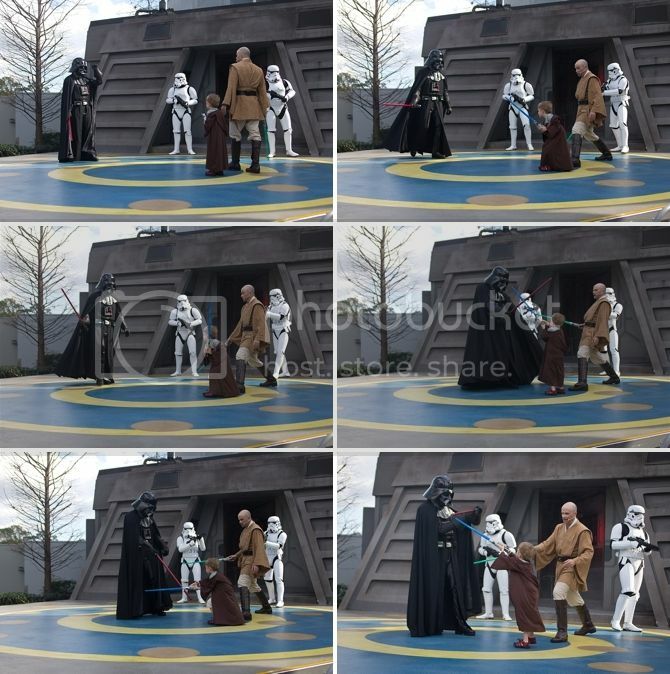 They practiced a little sequence of moves as a group--and then one by one got to fight Darth. I still need to see Big Hero 6! I'm pretty sure I will love it! Also, Parker needs a snickers.